We are still within the ’12 Days of Christmas,’ and in the past few days I have had a few post-Christmas strolls along the piers and promenades of Dún Laoghaire and Bray, where the Victorian bandstands are reminders that seafront strolls have been a popular way of getting back into shape for almost 200 years. The East Pier in Dún Laoghaire, which is popular with walkers from throughout South Dublin, and the Victorian bandstand and shelter are important features of this pier. The harbour dates from 1817, and the bicentenary celebrations last year included art, theatre, architecture, food, literature, the spoken word and sailing, with President Michael D Higgins opening the celebrations last May. The harbour was built over a 42-year period from 1817 to 1859. 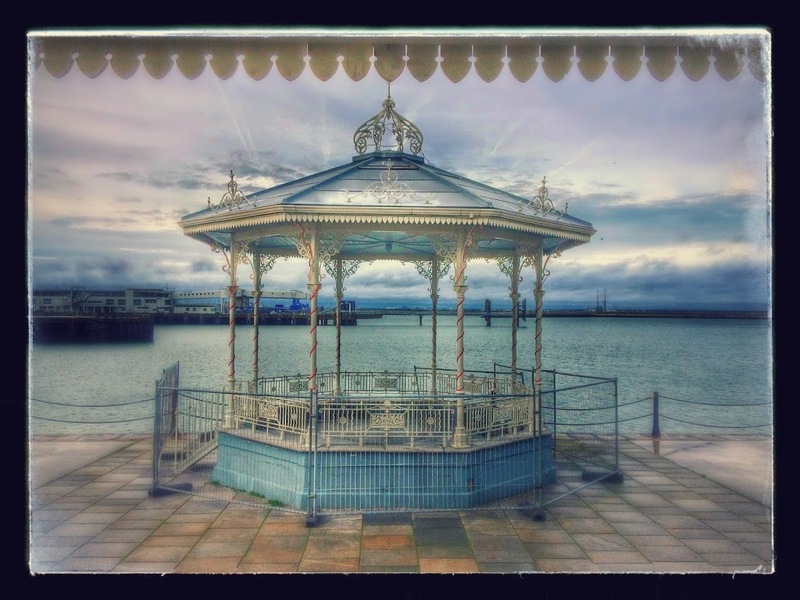 As part of the preparations for last year’s celebrations, the bandstand and shelter were restored to their original condition in 2010 by the Dún Laoghaire Harbour Company. Both buildings boast cast-iron filigree bracketing their columns. The bandstand has an ornamental dome, while the sun shelter has a slim, tough truss. Both structures have been restored between 2007 and 2010 to bring them back to their Victorian glory. The detailed ornate brackets, dainty roof crests and ornamental features painted in crisp white make for a visually stunning centrepiece on the East Pier and they give the harbour an appearance more like a seaside resort than a bustling, busy port town. 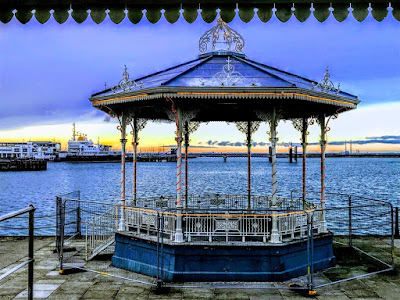 Both the bandstand and the pier feature in the movie Michael Collins (1996), in a scene where Liam Neeson (Collins) and two of his co-stars walk along a seaside promenade that is Dún Laoghaire East Pier, and a band is playing on the bandstand. 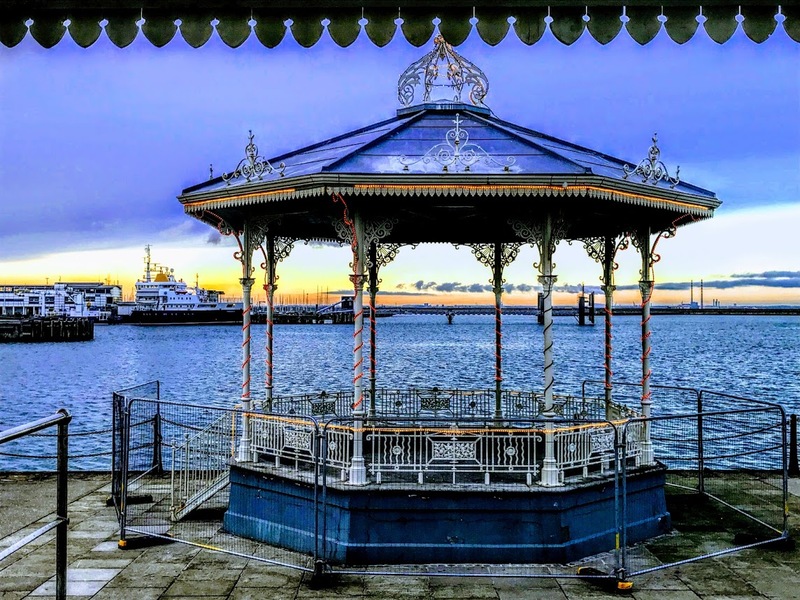 Today, many people find the bandstand is a perfect spot to take a rest during a walk along the pier and to take in the views of the harbour and the bay. During holidays and summer festivals, the bandstand is often a venue for local musicians to entertain people. The bandstand on the garden side of Esplanade in Bray is the only bandstand from three that has survived through the changes of time. Like many Victorian bandstands, it is octagonal in shape and has decorative cast-iron columns that support a copper clad roof. The Esplanade in Bray was laid out in 1859-1861 by William Dargan. It includes a concrete path that is four metres wide and that separates and protects the gardens from the beach and sea, with a number of openings to and from the beach and the gardens. The other surviving buildings on the garden side include a small rectangular plan shelter built in cast-iron and timber and with a metal deck roof, and small kiosks wit copper clad roofs. 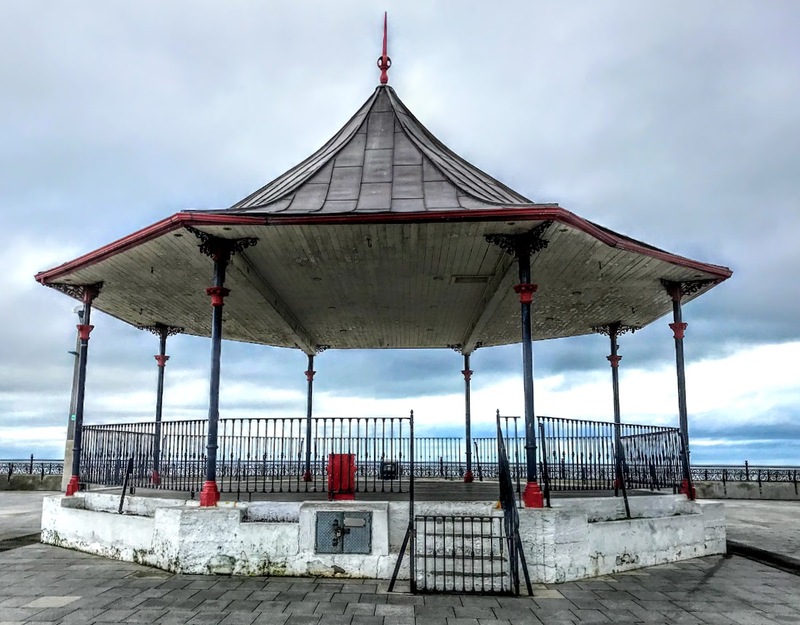 As the last surviving member of a group of three, Bray’s bandstand is a valuable, useful and decorative Victorian legacy that fits in with the 19th century buildings along the promenade. Earlier in the year, I also became familiar with the bandstand on the seafront promenade in Kilkee, Co Clare, on the Wild Atlantic Way. This bandstand, which is a protected structure was only built as recently as 1940. But it looks like other Victorian bandstands with its octagonal shape and design. Its felted octagonal roof is capped with a cast-iron spike. Paul Conway architects carried out a project of conservation and refurbishment of the bandstand on behalf of Kilkee Civic Trust in 2014. The work included replacing the roof structure and finishes, and repairing the ironwork structure. Despite its more recent date, the bandstand reflects Kilkee’s rich Victorian heritage, and a recent report suggested the bandstand as an ideal starting point for an interpretive trail of markers and footpaths leading visitors on a Victorian Heritage and Local History Trail around the town and the west end. The sea wall and embankment around the bay began on the west side as part of famine relief work in 1846 and were completed in the 1860s. Kilkee has had a number of famous visitors over the years; the poet Alfred Lord Tennyson visited in the 1840s, and Charlotte Bronte spent most of her honeymoon in Kilkee in July 1854. In 1896, the Crown Princess of Austria visited the town. At one stage in the Victorian era, the beach in Kilkee was divided into three parts, the middle part for men and the two outer ones for women. This arose when local magistrates heard complaints that men were bathing naked. Women were more modest, they entered the water by means of bathing boxes or machines that were towed out into the sea so that a lady could dip in the sea away from prying eyes. The first bathing box erected in the West Clare resort in the 1830s was known as the Lady Chatterton, after the traveller and writer Georgiana, Lady Chatterton (1806-1876), later Mrs Dering, whose Rambles In The South Of Ireland During The Year 1838 was published in two volumes in 1839. Lady Chatterton wrote at a time when tourism was beginning to develop, and her writing is marked by her high moral tone and her earnest desire to do good. She bubbles with enthusiasm as she discovers the hidden delights of Kilkee and West Clare, but she avoids the scenes of squalor and destitution. These bathing boxes, used for changing until the 1950s, have disappeared, but the bandstand still stands on the seafront. Last month, the bandstand was the venue for an evening of carols organised by Kilkee Chamber of Commerce. 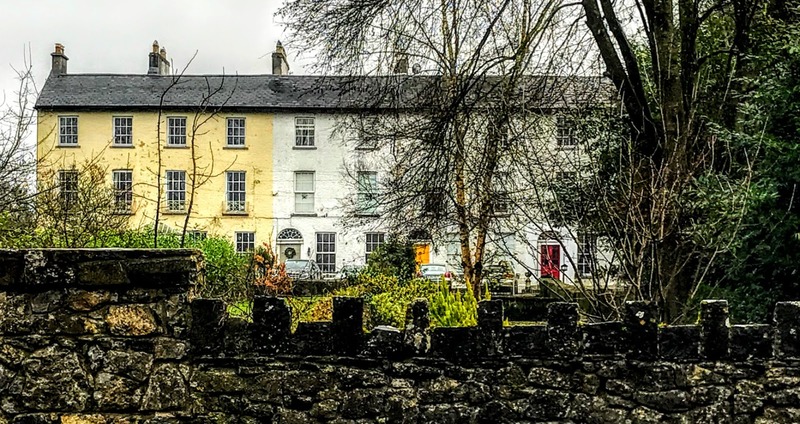 Castleconnell in Co Limerick has retained its 18th and 19th century character with the traditional facades of the shops, pubs, hotels and houses. 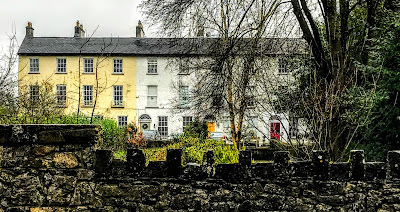 The abundance of elegant Georgian and Regency houses gives the village a unique character that is unusual in most Irish villages. On the edges of the village, the Tontines is a fine terrace of four Regency period houses built in 1812. Samuel Lewis notes in his Topographical Dictionary that the Tontine terrace was built by William Gabbett through a fund raised by subscription. Tontines were an investment plan in which participants bought shares in a common fund and received an annuity that increased every time a participant died, with the entire fund going to the final survivor or to those who survived after a specified time. In Limerick, the terrace of Georgian houses on Pery Square is known to most people as the Tontines because it was built as a speculative development by the Pery Square Tontine Company in 1835-1838. By 1838, the houses in the terrace were let to tenants. The most widely-known Tontine-inspired stories include Robert Louis Stevenson’s novel The Wrong Box (1889), Agatha Christie’s 4.50 from Paddington (1957), a Miss Marple murder mystery, and Something Fishy (1957), a novel by PG Wodehouse. The Wrong Box was made into a movie by Bryan Forbes (1966), and the star-studded cast includes John Mills, Ralph Richardson, Michael Caine, Peter Cook, Dudley Moore, Peter Sellers, Irene Handl, Nanette Newman and Tony Hancock. The word ‘tontine’ is derived from Lorenzo de Tonti, an Italian political exile living in France. He proposed the original tontine to Cardinal Mazarin in the early 1650s to help King Louis XIV raise revenue. The French treasury, depleted by the Thirty Years War and rebellions in France, needed to raise money. The idea spread to Italy, Switzerland and Britain, but Tontines in their purest form were banned in Britain under the Life Assurance Act of 1774, primarily because of the perverse incentives inherent in a product that offers benefits when others die. In a tontine investment scheme, the shareholders derive some profit or benefit while they are living, but the value of each share devolves to the other participants and not the shareholder’s heirs on the death of each shareholder. But Gabbett’s speculative venture in Castleconnell was a financial failure, but his houses, which are set back slightly from the line of the road, form an elegant terrace that is an attractive feature in the streetscape of the village. At the right-hand end of the terrace, No 1 is an elegantly proportioned and substantial house. This is an end-of-terrace, two-bay, three-storey house with a basement, and with a wrought-iron balcony on the first floor. A round-headed opening over the timber-panelled front door has a cobweb fanlight and the doorcase is flanked by Ionic-style columns. This house retains its original form and character, with important salient features and materials. The early surviving wrought-iron balcony and limestone dressings contribute to the historic character of the piece. In 2012, the Mitchell family was living at No 1. John and Camilla had lived there since the 1960s having returned from Chepstow in England with their three children. No 2 The Tontines, is a mid-terrace, two-bay, three-storey house with a basement and wrought-iron balconies to first floor. A round-headed opening over the timber-panelled front door has a cobweb fanlight and the doorcase is flanked by Doric-style columns. William and Elizabeth Breen and their family moved into No 2 The Tontines in February 1981. No 3 The Totines is a mid-terrace, two-bay, three-storey house with a basement, but without a balcony. A round-headed opening over the timber-panelled front door has a cobweb fanlight, and the house retains many unique features. Bruce, Colette and Saibhe Bullock were living at No 3 The Tontines in 2012. In May 2015, this carefully renovated house, was placed on the market through Sherry FitzGerald O’Malley with an asking price of €450,000. The four-bedroom house has 3,250 sq ft of living space with features such as high ceiling and cornicing, original fireplaces and floorboards and a cellar in the basement. The rooms include a large drawing room and a large dining room both with fireplaces and original flooring. At the left-end of the terrace, No 4 is an elegantly proportioned and substantial Regency or Georgian house, and retains its original form and character. This end-of-terrace house was formerly the rectory in Castleconnell. This end-of-terrace, four-bay, three-storey over basement house also has a porch at the front. The wrought-iron balcony on the first floor, the sliding-sash windows and the limestone dressings all contribute to the character of the house. Above the timber-panelled door, the round-headed opening has a cobweb fanlight and the door is flanked by Ionic-style columns. In 2012, the O’Connell family was living at No 4 The Tontines, known as the Glebe House. The residents of these houses celebrated the bicentenary of the Castleconnell Tontine in 2012. This terrace of houses remains an elegant and attractive feature in the streetscape of Castleconnell.